Some bathrooms are relaxing spaces. Others are a little more hectic. We display some washstands and bathroom accessories in our showroom. Whether it's yours, a guest's, or a little one's, every inch of a bedroom should feel loved and welcoming. 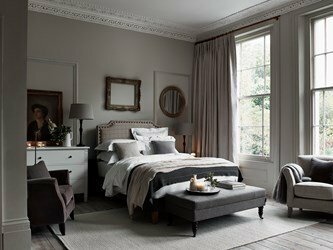 Every one of our Neptune bedroom collections is as beautiful as it is practical. You can blend pieces from each product family, lead with your heart and not your head. From the classic English style of Chichester to Francis upholstered bed bases, beautiful Larsson furniture and Wardley. A little effort makes a big difference in this most under-rated room in the house. The bathroom and cloakroom. Neptune take our inspiration from nature for this special room. Surrounding yourself with relaxing, calm colours, tactile sensations of woods, marble and limestone helps to create a perfect place to sit and relax. A little 'me time' with the door closed and perfect surroundings equals, splendid isolation.